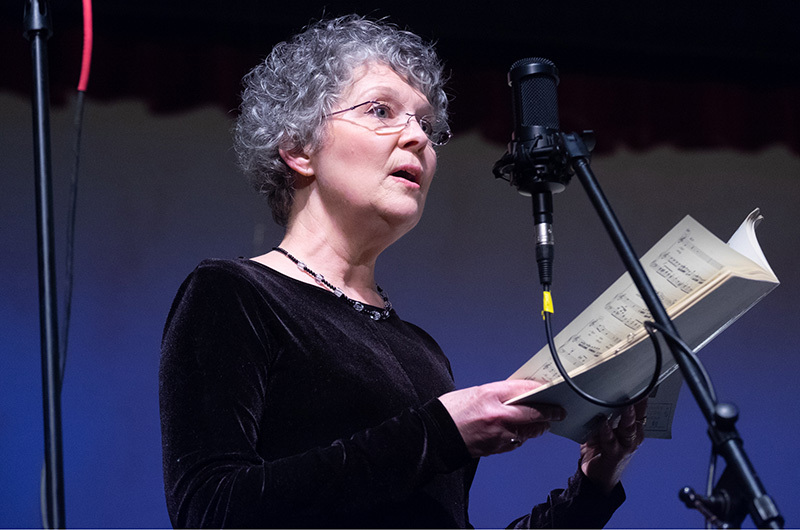 Separated by nearly 300 years, Vivaldi’s Beatus Vir and Eric Whitacre’s The Seal Lullaby were standouts in this year’s spring concerts by the Island Community Chorus, but every piece on the program was a showstopper in its own right. The chorus rehearses weekly and performs three times a year, with concerts in April, July and December. While the summer program hews to patriotic Americana and winter concerts have a Christmas theme, the spring shows are where music director Peter Boak chooses a fresh challenge for his singers. In 2016, the chorus was joined onstage by nearly three dozen instrumentalists for the mighty Brahms Requiem. Last spring’s concerts drew from musical theatre. This year, Mr. Boak told audiences, he wanted to field a smaller orchestra than in 2016. 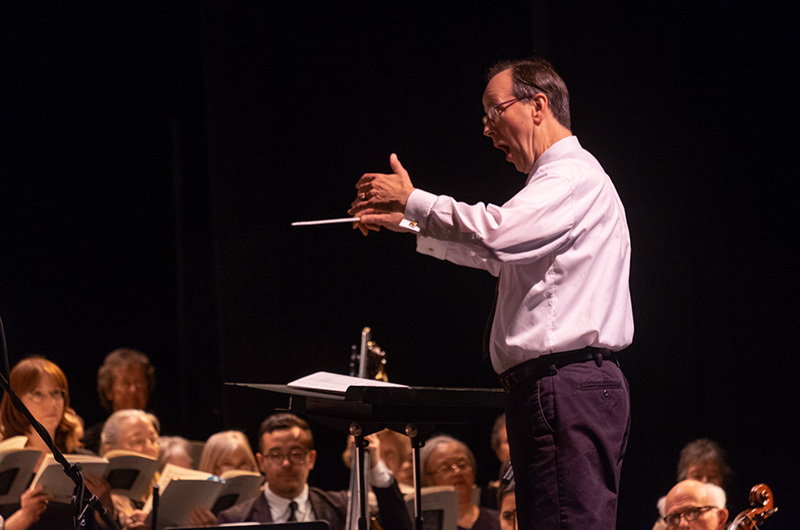 “This piece is new to us and probably to you as well,” the veteran conductor said as he introduced Beatus Vir (Blessed Is) RV 597, Vivaldi’s intricate setting of the 112th Psalm in Latin, to the audience at the Martha’s Vineyard Performing Arts Center. For this intricately joyous work, which Vivaldi wrote between 1713 and 1719, two string quintets flanked a portable pipe organ played by longtime chorus accompanist Garrett Brown. Brown’s organ, with the two cellos (played by Diana Golden and Stephen McGhee) and double basses (Michael Tinus and Moisès Carrasco) provided the continuo or foundation of the baroque piece — “gluing it all together,” Mr. Boak explained. 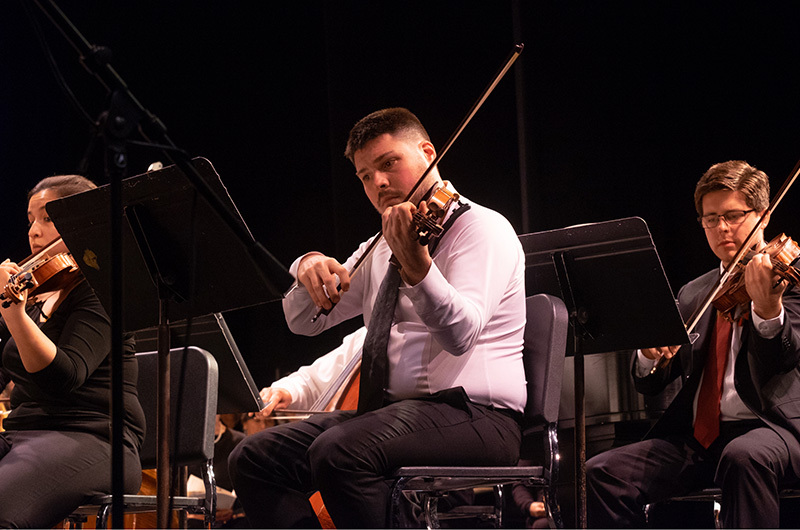 The violins (played by Rebecca Laird, Aurora Mendez, Robert Radliff and concertmaster Suliman Tekalli) and violas (Nicholas Citro and Gregory Williams) added filigrees above the continuo, Mr. Boak continued. Vivaldi also wrote exuberant vocal filigrees for the smaller solo and ensemble parts within Beatus Vir, performed here with astonishing precision and verve by sopranos Molly Conole and Jenny Friedman and tenors David Behnke and Dorian Lopes. Though not as monumental in scale as the Brahms Requiem, Vivaldi’s sumptuous massed choirs, dueling orchestras and elaborate vocal lines made Beatus Vir a rich, complex and rewarding experience for Island audiences. The grand triple Amen at the end was greeted with enthusiastic applause by both audiences. “That was a workout, but a very fun one,” Mr. Boak said, smiling. After pausing briefly to roll out Mr. Brown’s concert grand piano, the concert continued with My Luve’s Like a Red, Red Rose, the late 18th-century Robert Burns poem arranged some 200 years later by American composer and choral director René Clausen. Violinist Mr. Tekalli and cellist Ms. Golden returned to the stage to play with the choir. For the stirring African-American spiritual Deep River, arranged by Donald Patriquin, Ms. Conole played French horn with Ms. Golden on cello. Mr. Boak and his choir returned to René Clausen’s work on Scottish themes with The Water is Wide, a widely-performed traditional song with roots in the 17th century. Clausen’s pensive arrangement featured Ms. Conole’s horn, Mr. McGhee’s cello and Julie Schilling on clarinet. The youngest composer on the bill, choral superstar Eric Whitacre, was born in 1970, Mr. Boak said as he introduced The Seal Lullaby. Based on a poem from Rudyard Kipling’s The Jungle Book, the song was originally written for a film that was shelved in favor of Kung Fu Panda, Mr. Boak said. The chorus was accompanied here only by Mr. Brown’s piano, which Mr. Boak called a fifth voice in the arrangement for soprano, alto, tenor and bass. The final work of the night, the spiritual Down to the River to Pray, brought every musician back to the stage along with acoustic guitarist Brian Weiland. Mr. Tinus swapped his upright bass for an electric one for this traditional gospel tune, which gained a massive audience after Alison Krauss performed it for the 2000 film O Brother, Where Art Thou? With a simple, yet compelling melody and lyrics, Down to the River was clearly as much of a joy to perform as it was to hear — and too short to play just once. On both Saturday and Sunday, Mr. Boak led the chorus and orchestra through it a second time, to delighted applause. Now entering its 22nd year, the Island Community Chorus summits a musical mountaintop every spring. 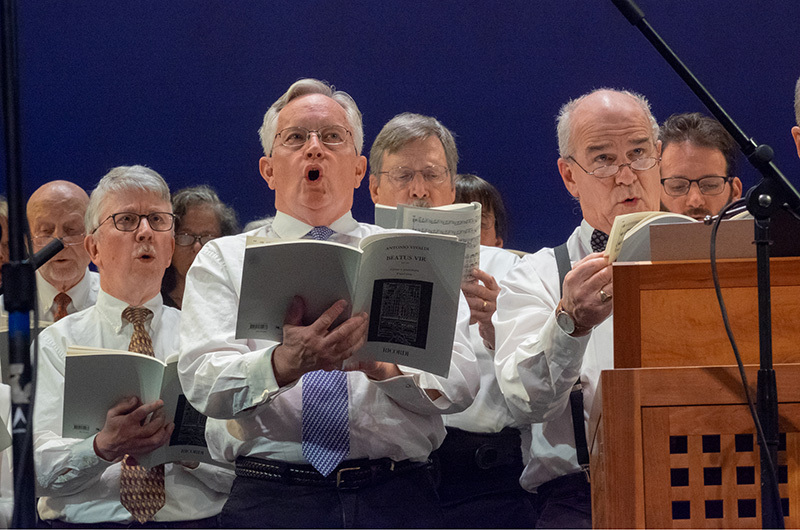 While big-city choral sophisticates may look down their noses at a choir that holds no auditions and is largely made up of senior citizens, they’re missing out on something that borders on magic. Islanders can take pride in what Mr. Boak, Mr. Brown and their singers achieve in these concerts. More pictures of Community Chorus spring concert. If I still lived on the Vineyard, I would want to be a part of this! I wonder how many former Minnesingers are members?